Susan gets her chance to shine .. In 1978 Susan was offered the part of Hattie starring opposite Brooke Shields in "Pretty Baby". The director of Pretty Baby then cast her in a role for "Atlantic City" when she earned an oscar nomination for her the character she played. The director of Pretty Baby and Atlantic City - Louis Malle and Susan soon started dating and she divorced Chris in 1979 thought remained good friends. In 1983 Susan played a bisexual lover to a vampire in "The Hunger" when she played opposite Catherine Deneuve and David Bowie. The next role she played was along side Jack Nicholson, Michelle Pfeiffer and Cher in "The Witches of Eastwick". Susan was told she would get the role of Alex a sculptor, but the role was given to Cher leaving Susan the part of Jane the Cellist. She had to learn to do this with no warning and was nearly elecrocuted during a swimming pool scene. Soon after Louis and Susan split, she briefly dated Sean Penn, but then got involved with Franco Amurri. She had her first child in 1985 Eva Marie Livia Amurri. 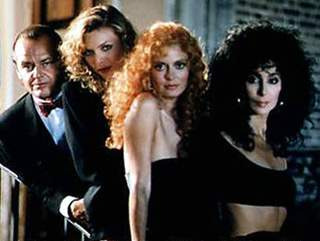 Susan (centre) with co stars in "The Witches of Eastwick"